Hottest Music, Crowd, Weather Yet! Week 2 of TCMF kicks off with a BANG! Rhythm Congress makes its fifth TCMF appearance and an appreciative audience GETS DOWN WITH THE GET DOWN! AUSTIN — The second week of the Texas Community Music Festival kicked off Saturday with a blaze of jazz licks, crooners, R&B fun, banjos, clarinets and African drumming as the Sixth Annual TCMF drew what could be its largest single day crowd ever at Central Market. The day kicked off with a set by the Trilogy Clarinet trio of Marble Falls and continued with a return engagement by the Austin Banjo Club. 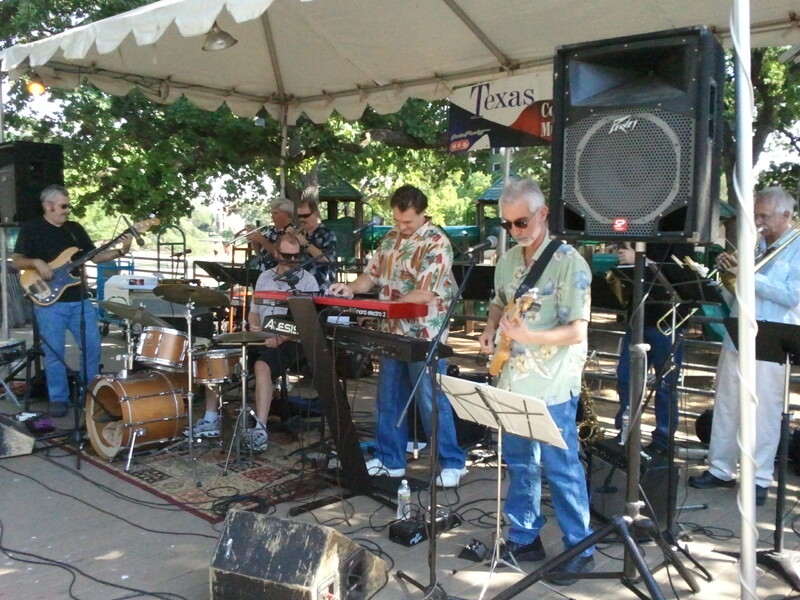 The energy on the Patio at the Cafe just continued building from there, as all three ACC jazz programs were featured, as well as longtime crowd favorites Rhythm Congress and Republic of Texas Big Band, two TCMF veterans. By the time Saturday’s headliners, the Djembabes, took the stage, there was little room to sit, as an enormous crowd enjoyed the spirited, soulful Western African drumming, chanting and dancing by the talented group. Check out our Video page for excerpts from every day of this year’s TCMF. And don’t forget to view the large collection of photos. The Texas Community Music Festival resumes at 3:00 pm Sunday, after a special Mother’s Day event at Central Market. Check the Schedule page for more details, and join us for another fabulous day of music.